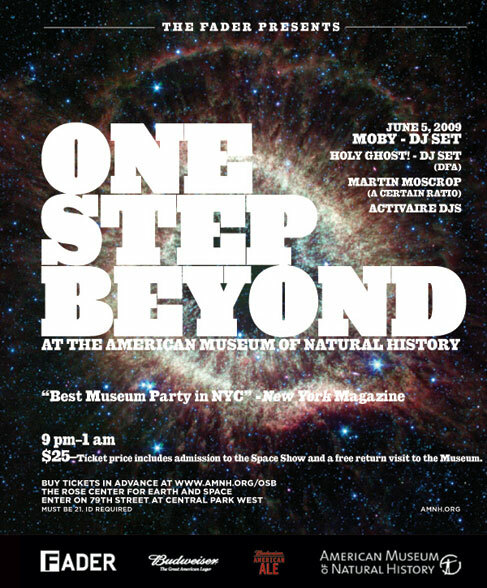 Moby, Holy Ghost, Martin Moscrop and the Activaire DJs are set to rock the monthly “One Step Beyond” party at the American Museum of Natural History this Friday (June 5) and I’m giving away a pair of tickets to the show courtesy of The FADER. The cool thing about this show is, (aside from it taking place inside a museum), that your ticket also includes admission to the space show and a return visit to the museum. To enter, send an email to contests@bumpershine.com and tell me the name of your favorite Planet (entrants must be 21 or older). Winners will be notified by end of day Thursday, June 4. In other related news, Holy Ghost!, Chromeo, Amazing Baby, Solid Gold, and U-N-I are just a few of the acts that will be giving away music in 2009 on Green Label Sound, a new free singles label backed by Mountain Dew. U-N-I’s “Land of The Kings”, the first “Green Label” single of 2009, is available for download now over here. Read the full Green Label Sound press release after the jump. PURCHASE, N.Y., May 27 /PRNewswire/ — Green Label Sound, a free singles label, today announced that U-N-I’s “Land of The Kings” is its first single release of 2009. Available for free download today at www.greenlabelsound.com, the single is Los Angeles-based hip-hop duo U-N-I’s first release since their self-released album “A Love Supreme.” In addition, Green Label Sound is unveiling a select sampling of upcoming releases which include tracks from Chromeo, Amazing Baby, Holy Ghost!, Solid Gold and many more. Inglewood rap duo U-N-I, “Thurzday” (Yannick Koffi) and “YO” (Yonas Michael), are the talk of the Internet and guiding hip-hop’s path in L.A. by juxtaposing music with customized fashion. The two MCs have loaded up on accolades over the past two years. They were awarded “Best Breakout LA Artist” at the 2008 MTV Video Music Awards and have been the subject of positive features in The Source Magazine, XXL, LA Times, and VIBE to name just a few. Green Label Sound’s earlier releases have featured a diverse roster of talented artists, including Brooklyn-breakouts Matt and Kim, Chicago duo The Cool Kids, former Whigs member Kuroma as well as the collaboration from production duo Flosstradamus and Chairlifts’ Caroline Polachek. Supported by Mountain Dew, Green Label Sound is a music program designed to showcase and support exciting, relevant, and unique independent artists via a wider exposure platform. All acts signed to the label are D.I.Y. artists who have elevated themselves while maintaining a strong loyalty to their underground roots. Green Label Sound aims to offer these artists the added access and resources necessary to break through to the next level.